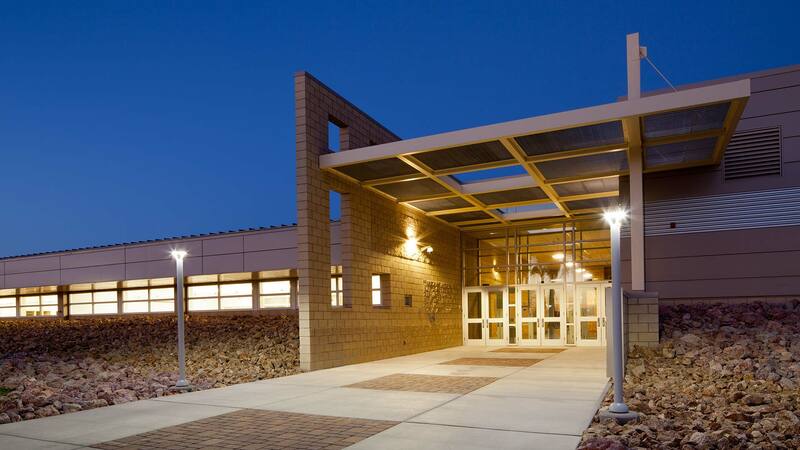 The North Las Vegas Readiness Center is a major readiness center for training and administration to complement existing resources at Las Vegas’ main National Guard installation. In addition to the Readiness Center building, the complex includes a security checkpoint building, open-air storage, and enclosed storage. Site development includes large military vehicle parking areas, private vehicle parking, pedestrian circulation and drainage retention structures and landscaping. The project is designed in accordance with anti-terrorism force protection criteria, including building standoffs, blast-resistant glazing, and security fencing. Sustainable measures include energy efficient mechanical systems, large overhangs for windows, materials with high-recycled content, drought tolerant landscaping and on-site water retention.